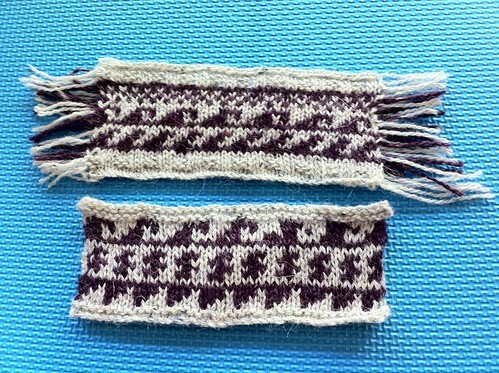 Swatched on size 2s, both of these came in at 6 stitches to the inch. The first one (bottom) was knit back and forth. I thought I might get a different gauge if I swatched in the round (above), but it came out the same (although, the stitches in the round are more even). My interchangeables only go down to 2, so now I have to determine if I will adjust the pattern from 7 sts/in to 6 sts/in, or if I pull out a fixed circular 1 and swatch yet again. I will already be changing the stranded colorwork to more of a Peruvian-inspired look—the pattern would guide me for fit—so it may be too much to also change the guage. I like the fabric created on the 2s, and it sounds daunting to knit a vest on size 1s, but it may have to be done.